It’s famous for its football, iconic dock, World Heritage and being home of The Beatles, but Liverpool’s food scene is worth a visit, too. Our culture-packed city has award-winning fine dining, but what about the smaller joints like the amazing Bold Street restaurants? Bold Street is well known among tourists and locals as the hub for independent businesses and was rated as one of the best shopping streets in the country by Lonely Planet. With shops selling everything from art to trendy clothes, it’s second to none in giving a unique perspective on the culture of Liverpool. And you can be sure this culture-hub doesn’t lack a range of great, cheap eats. From Moroccan to Indian to American, there is something for everyone that will please your taste buds and your wallet. So in no particular order, here are the top ten cheap eats in and around Bold Street. 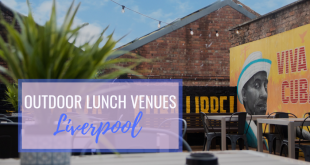 An American-style dive bar with a nod to German camaraderie and scouse humour, Salt Dog Slims packs a friendly atmosphere, plenty of beer and gourmet street food into a trendy bar with a great menu. If you’re interested in trying the best hot dog you’ll ever have, Slim’s mouthwatering dogs are served in a succulent brioche bun and smothered in a choice of several toppings. We highly recommend the Aye Carumba (£4), a Mexican inspired dog topped with sour cream, chives, jalapeños and crushed nachos – and don’t forget to pair it with a stein! Price: The food menu ranges from £3-£6, and although the cocktail menu is slightly pricier, the mixologists at Salt Dog Slim’s make it worth the cost. American burgers and slow cooked meats are served with style in this New York-inspired restaurant. It’s casual setting screams trendy with exposed bricks, naked bulbs and distressed wooden seating. The menu is mouthwatering and a meat-lovers dream – from brie and bacon grilled cheese (£8.50) to a hot mess burger (£10), you won’t know where to start. As for starters, Nolita’s are too interesting to pass up. Frickles (yes – deep fried dill pickles) are a mere £3, and hush puppies (£4) will have you eating small, savoury donuts made from beer, cheese and cornmeal, drizzled with blue cheese. Price: Most mains at Nolita Cantina come in at £8.50. Come from Tuesday-Friday between 12-5pm and get any sandwich and bottomless fries for £7. If you’re looking to watch the footy, have a pint and some pizza, look no further. TriBeCa has made its mark on Berry Street as a trendy, New York inspired bar serving stone baked pizzas, classic cocktails and, of course, beer. Its laid back atmosphere is refreshing, and similar to the establishments you’d find in New York City. The menu, most importantly, does not disappoint. All 36 pizzas on offer range from £6.95-£8.95 and cater to every taste. Price: Pizzas range from £6.95-8.95, and starters, salads and desserts are also on the menu. Named one of the best brunch spots in the UK by Sunday Times’ The Dish magazine, this Bold Street coffee house boasts a laid-back atmosphere complete with long wooden tables and leather sofas. The menu offers light and full varieties of breakfast and provides vegetarian and vegan alternatives to the full English – a welcome choice for many. The menu is much more than your average cheese toasty, though. If you’re in the area, try the sweet potato wedges with rosemary rock salt and saffron aioli for £4.25 – they’re amazing. And to all you tea lovers out there, Leaf is where you need to be – they offer nearly 60 different types of tea. Price: Items on the food menu range from £1.50 up, with the majority of mains around the £7 mark. Taking inspiration from the streets of Mexico, this cantina/tequila bar is full of flavour both in food and atmosphere. The menu has everything from popcorn dusted in chilli (£1.95) to spiced pulled pork taquitos (£5.95) and it’s contemporary twist on Mexican décor will have you wanting to come back for more. Price: A little pricier than the rest, LuchaLibre’s menu ranges from £1.95-13.95, with most mains coming in between £5-£8. Marketed as “the best route to Beirut”, Backchich does not disappoint as Bold Street’s finest Lebanese restaurant. They offer an extensive selection of Lebanon’s best street food, including hot and cold mezze (priced at a very reasonable £2-£4) and Shawarma offered in both lamb and chicken. The restaurant’s name, which means ‘loose change’, is a nod to their more-than-affordable prices. Price: The mezze (starter) dishes come with Lebanese pickles and bread and range in price from £1.95-£4.95. The main dishes (salads, shawarma and wraps) are priced from £3.50 up. Mowgli’s bright atmosphere and unusual menu make this Bold Street restaurant a fun alternative to Indian restaurant clichés. Birdcage lights, wooden seating and ships’ rope are the first step inletting customers know this restaurant is a million miles away from your average curry house experience. The menu boasts gluten free and vegan alternatives to the main street food dishes and, with the exception of a £14 food roulette take-away box, is light on your wallet. Price: The menu ranges from £1.50-£8.50, with mainsaveraging £6. A great little hide out in the middle of the city, The Attic Bar on Parr Street serves some of the best hot dogs in town and a fine selection of beers from all over the world. With an outdoor terrace and barbeques every weekend, you won’t have to look much further for a boozy summer hangout spot. Open Wednesday, Thursday, Friday from 1pm until late and Saturday and Sunday 12pm until late. Price: The Attic’s menu is easy on the wallet with deals on nearly every day. Check out their Facebook page for deals like £5 burgers and hot dogs, £10 for any main and pint, a free drink with any dog or burger and 20% off food all day. The food here is hearty, authentic and healthy and offers an extensive selection of North African dishes for both meat-lovers and vegans. The menu emphasizes on tagines and charcoal grills, and offers tapas for those who like more choice. For early risers, a Moroccan-styled full English is offered between 10am and noon and includes everything you would expect: sausages, baked beans, scrambled eggs, grilled tomatoes and bread – but all done the Moroccan way. Recently renovated, Kasbah’s style feels simple and authentic – a true taste of Morocco on Bold Street. Price: Mains at Kasbah average around £9. Come between 12pm and 5pm and receive a two course lunch for £10.95. Bold Street Coffee’s simple exterior is no reflection of the amount of detail that goes into its food. A nearly all day breakfast is served until 4pm and offers interesting alternatives to your usual bagel and butter, while lunch focuses on warm, cheesy sandwiches and creamy soups served by passionate baristas. Make sure to watch out for daily specials and seasonal offerings. Price: Breakfast items range from £2.95 for a bacon butty, to £6.95 for scrambled eggs with highland smoked salmon. Lunch ranges from £2.95 for a cheese toasty, to £4.95 for a turkey and bacon club sandwich. What’s your favourite “cheap eat” in Liverpool? Tell us in the comment section below. A Canadian living in Liverpool, Jen loves to write about the best attractions and experiences the city has to offer.